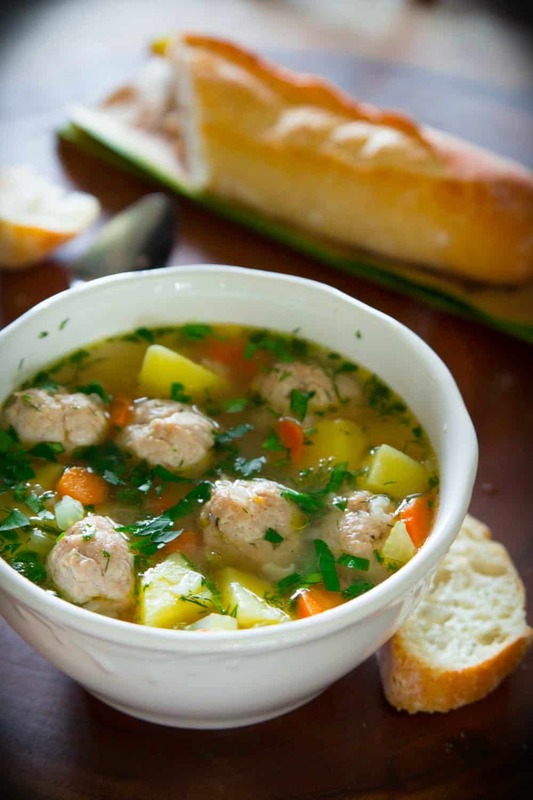 This Homemade Chicken Meatball Soup is the healthy dinner recipe you were looking for today. Delicious, easy to make, and of course healthier than traditional recipes, it is a hit with the whole family. If you like the addition of noodles in your soup, try my chicken noodle soup and lemon chicken orzo soup recipe! This homemade chicken meatball soup takes me back to my childhood. It was my grandmother’s signature soup that we enjoyed all year round. It can be enjoyed in the winter or summer. Since it has meat and vegetables I consider it a comfort soup. It’s also considered a clear soup, meaning there are no thickeners or dairy products. Therefore it’s a fairly light soup. I loved this soup as a child and now my 2-year-old daughter enjoys it too. When making any kind of soup I prefer to use homemade chicken stock. Not only is it healthier, but it’s also a lot tastier too. For the complete list of ingredients with measurements and directions for cooking, see the printable recipe below. 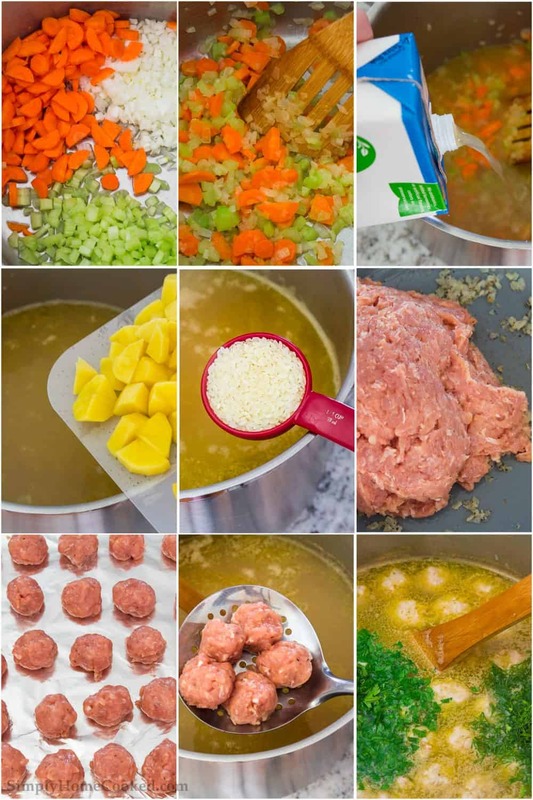 Prepare your meatballs according to directions below and set aside. Heat onion, carrot, celery until tender in a large pot. Stir in chicken broth, potatoes, and bring to a boil. Add in rice, and meatballs, continue cooking as directed. 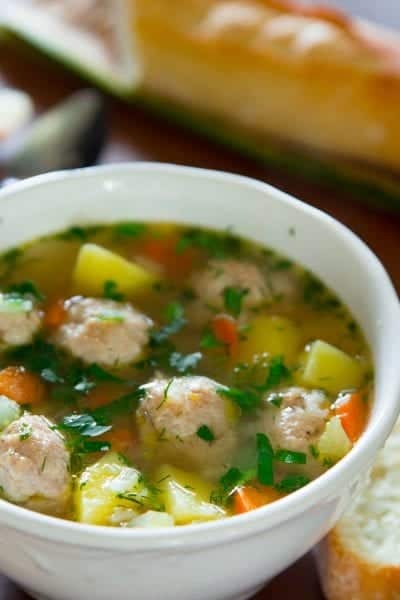 This chicken meatball soup is best served piping hot with a piece of crusty bread on the side for dipping. My grandma inspired this amazing chicken meatball soup, and I know you will love it as much as my family. For more delicious soup options, see my favorites linked below for your convenience. In a skillet, sauté 1/2 cup chopped onion in olive oil over medium heat. Once the onion is cooked, mix in the salt and pepper. Remove the skillet from heat and add the ground chicken thighs to the sautéed onion. Mix until the onion is well incorporated. Form the ground chicken into meatballs about 1 inch in diameter. Then set aside. In a pot, heat 4 tbsp olive oil over medium heat and sauté the chopped onion, carrot, and celery. Add the pealed and chopped potatoes to the pot and bring to a boil once more. Then add the rice to the pot. Once the rice is half way done, add in the meatballs. Cook the meatballs over medium high heat for about 15 minutes or until they are cooked through completely. Add parsley, dill, salt, and pepper. Cook for an additional 3 minutes. Loved this recipe. Reminded me of back home at my moms. Thanks again! You’re so welcome Natasha! I love when my recipes bring back good memories of mom’s home cooking ???? Made it today and it turned out so well!